Ireland has relatively few mammal species. Its island location on the western edge of Europe meant that few species managed to establish once the ice retreated after the last Ice Age. Those that did so are termed ‘native’. Other animals have arrived since and become naturalised. Many were deliberately introduced, often to the detriment of our native species. Most of Ireland’s land mammals occur in Wicklow Mountains National Park, but there are a couple of species that do not. For example, Lesser Horseshoe Bats are found only in the west of Ireland. Naturally, the National Park does not have any marine mammals, since it does not have a sea coast. Two mammal species lived in the mountains before the Park was established but are now extinct. The Giant Irish Deer / Irish Elk (Megaloceros giganteus) died out as a result of natural changes in the environment. Man, however, exterminated the Wolf (Canis lupus), leaving no natural predator to control the population of herbivores. Twenty eight species are recorded within the National Park. (See checklist below). Most are shy of humans and can be difficult to see. Most sightings are fleeting. Many of our mammals are nocturnal. Deer and feral goats, however, are large, easy to see and often more tolerant of humans. Mammal tracks and signs are more easily found – snuffle holes on the lawns made by badgers, chewed pine cones and split hazel shells by red squirrels, feathers that are the remains of a fox’s dinner. If you tread quietly, and look and listen carefully, you might be lucky. Always remember, if you do encounter any wild animals, do not disturb them. Watch from a distance and allow them to make their own way. Ireland has only one native deer species – the Red deer. Sika deer were introduced to the Powerscourt Estate in Co. Wicklow in 1859. They soon escaped and started to breed with the closely related Red deer. There are now very few pure Red deer in Wicklow. Most look like Sika deer. Probably all are hybrids. Red deer are our largest land mammal. Sika deer are quite small by comparison. Fallow deer also occur in places, such as the neighbouring Clara Vale Nature Reserve. The history of Ireland’s feral goats is not entirely known. Large herds of them are found in Glendalough and Glendasan, but whether they went wild when the mines closed down, or whether they have been around since St. Kevin’s time, no one knows. Due to the lack of a natural predator the goats and deer of the Park have to be culled to prevent overgrazing within the Park’s important woodlands. The wolf was the only wild predator of deer and goats in Ireland. Its eradication in the 1700s has upset the balance of nature. Hunting by the general public is not permitted. Deer are easily spotted on the open hills. The deer along the white walking trail in Glendalough (Spinc & Glenealo Valley) are used to walkers and are often relatively close. It is worth visiting in Autumn when the deer are rutting. 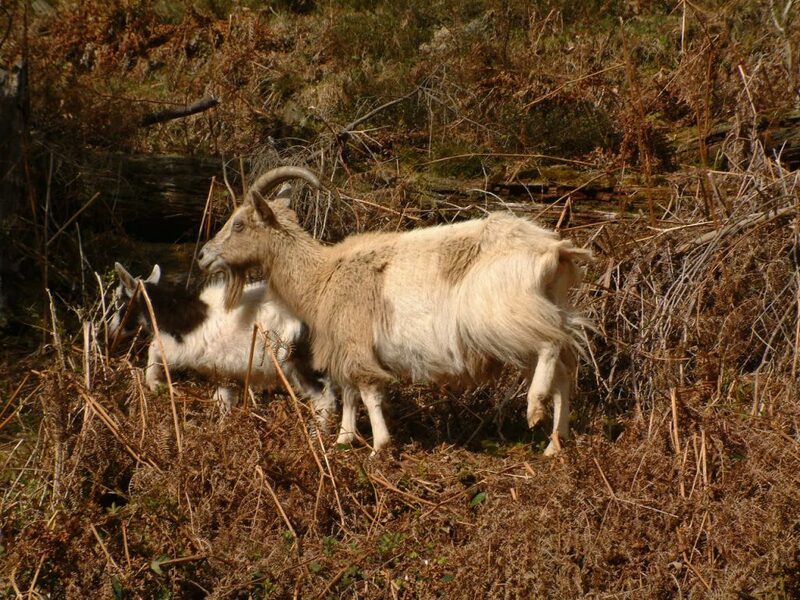 Wild goats can be spotted almost anywhere in Glendalough, especially in winter when they come down to the valley floor. The Miners’ Village is often a good place to look. Ireland has no large or dangerous carnivores. Red foxes are common, but whilst urban foxes are reasonably unafraid of people, rural foxes are shy. They hunt mainly at night or at dusk or dawn. Any smaller creature is fair game. Badgers are very common in parts of the National Park. They live communally in underground setts, and emerge at night to feed. They are omnivores and will eat almost anything. Worms and beetles are the commonest food items. Despite their undeserved fierce reputation, badgers are shy harmless animals. Badgers belong to the Mustelid family – long bodied, short legged carnivores. Many of Ireland’s carnivores are mustelids. Small stoats hunt mice in stone walls and burrows. Ireland has its own subspecies of stoat.They are rarely spotted, making a sighting always special. The pine marten is another Irish mustelid. The Irish name ‘cat crainn’ translates as ‘tree cat’, which suits it rather well. They hunt squirrels in trees, and do have a rather cat like appearance. Populations of pine marten have increased in recent years, and a chance encounter is now more likely. Otters occur in low numbers in Wicklow’s lakes and rivers. They feed on fish. The Wicklow Mountains are a designated SAC (Special Area of Conservation). The otter is one of the species that it has been designated for. Mink were introduced from North American, most likely as escapees from fur farms. They swim well and can harm nesting waterbird populations. Ireland has ten species of bat, nine of which occur in the National Park. Many are easily spotted at dusk, although telling the difference between the species can be a challenge. Daubenton’s bats can be found flying low over water, catching insects. The National Park’s Information Office has a nursery roost in its attic. Several hundred pregnant Soprano Pipistrelles move in to the attic each spring, to have their babies. The Park organises several bat walk events each year which are very popular withal ages. The Red squirrel is probably the most popular Irish rodent. Unlike the introduced north American Grey squirrel, the Red is shy and will avoid people. The woods of Glendalough are a good place to see them, especially in the pine trees along the Miners’ Road. Our other rodent species – rats and mice, are unpopular with most people. Wood mice are quite attractive little creatures, however, with their rich chestnut coat and large black eyes. They live in the wood feeding on hazel nuts and seeds, and are an important food source for owls, foxes and many other hunters. The Irish hare is a true native species, and a unique sub-species. It was believed that Irish hares did not turn white in winter, unlike their continental cousins. However, several people reported seeing white hares in an extremely severe winter recently. Hares live in open habitats and can be found on the open mountains. Unlike rabbits, they do not dig burrows, but sleep above ground. Rabbits are found at lower, drier altitudes where they can find suitable soil to burrow in. Most of the National Park is not ideal rabbit habitat, but the valley of Glendalough has some rabbit warrens. The hedgehog is a much loved Irish animal. It feeds on slugs, worms, and other invertebrates. Its spines protect it from most predators, but are no match for badgers. As a result, where baders live, hedgehogs tend to be absent. The Pygmy shrew is Ireland’s smallest mammal. It can sometimes be heard squeaking or fighting in long grass. Irish mammals are protected by the Wildlife Acts 1976 and 2000. Some species that are rare in Europe also receive special protection under European Law. One such animal is the Otter. The Park and most of the Wicklow Mountains have been designated a Special Area of Conservation for the Otter.